Chartered IT Professional has a Certificate of Current Competency component, meaning IT Professionals must stay current while holding accreditation. The CITPNZ variant of Chartered IT Professional, as administered by ITP NZ, does not differentiate between CITPNZ and the Certificate of Current Competency. Those with CITPNZ must remain current to remain a Chartered IT Professional and if not, the certification will lapse. The public can have confidence that those with CITPNZ are current practicing professionals. continue to meet the practice standard (operating at SFIA Level 5). Chartered IT Professionals NZ (awarded by ITP) must comply with the ITP Code of Ethics at all times. One principal ethical consideration is that of confidentiality of client information. IT Professionals are entrusted with access to all kinds of sensitive information, from trade secrets and commercially sensitive data through to personal emails. A true professional does not abuse this trust. The Chartered IT Professional must notify ITP immediately where any legal action is taken against them, whether criminal or civil, alleging professional misconduct, theft, fraud, or any other matter of dishonesty. ITP may suspend the CITPNZ of any member while a review is conducted to ascertain whether a breach of Professional Conduct has occurred. Chartered IT Professionals must complete a minimum of 30 hours of Continued Professional Development (CPD) per year, as defined in the ITP Bylaws. This is calculated on a points system. You should keep a record of CPD, as it is audited periodically. Additionally, evidence needs to be provided as part of the 5-yearly renewal. A requirement of all professionals, regardless of profession, is that they give back to both the professional community and the public, thereby improving the profession and contributing to a better world. Must be for the good of the IT professional community or public at large. Enough options will be made available through ITP and third parties to ensure there are suitable options for all professionals. CITPNZ has a strong focus towards Peer Assessment. To ensure the quality of the programme it is an expectation that Chartered IT Professionals will assist in the assessment of future applicants. Chartered IT Professionals are expected to contribute to the assessment of 1-2 other Applicants per year, each involving approximately 30-45 minutes (including a teleconference interview). 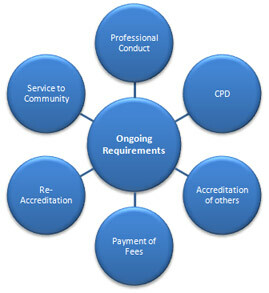 This can be used to count towards the "Service to the Professional Community" requirements. Annual certification fees and ITP Membership dues must be paid on time to maintain Chartered IT Professional NZ. Failure to pay these Fees and Dues by the due date may result in ITP temporarily withdrawing CITPNZ, or, if Fees remain unpaid, cancelling the member's accreditation. To ensure a high ongoing standard all Chartered IT Professionals with CITPNZ must renew the current competency requirements every 5 years. Renewing the certificate of current competency involves submitting a written document demonstrating that all entry and ongoing requirements of CITPNZ are still being met. If this is not renewed, CITPNZ will lapse if 63 months has passed since CITPNZ was awarded or the last renewal. Ready to apply for CITPNZ? Ready to apply? The main application is submitted online and you can complete this over time. The online process will guide you through the application process and you can submit your application when you're ready.